In 1991, Brenda Laurel suggested that we see “Computers as Theatre,” prompting the community of programmers and software developers to perceive and design computer interfaces in interactive terms for the sake of the user. The model she based her theory on, however, was mainly Aristotelian drama. Key elements in her theory are the concept of action and the format of dialogue rather than the model of postdramatic theatre that was becoming established at that time mainly in Europe. Annie Dorsen and Edit Kaldor’s “desktop performance[s]” do the inverse and invite us to perceive theatre —not drama— as computers and to ask what happens to the text, its production and its producing agents in this new constellation. Dorsen and Kaldor’s stagings of imbricated human and non-human writing agents and technologies can be considered “cyborgean” in the metaphorical sense proposed by Jennifer Parker-Starbuck in her Cyborg Theatre (2011): rather than staging “fictive or visual cyborgs,” performances like these stage “metaphoric moments of emergence” of the cyborgean relation between technology and body, including absent bodies (absent or telepresent performers). Hello Hi There (2010) by Annie Dorsen and Or Press Escape (2002) and Web of Trust (2016) by Edit Kaldor are performances that are all actually or seemingly coauthored before or during the performance and characterized by real-time writing in front of a live audience. Dorsen co-writes mainly with non-humans, i.e. algorithm-driven chatbots that create the effect of a dialogue for an audience present in the theatre. Kaldor co-writes mainly with humans, but largely mediated by the computer and the social network operating in her performance. Some collaborators and audience members are present in the theatre though most of the former are mainly telepresent via Kaldor’s social network site. What, then, are the implications of such practices of live coauthorship, for the appearance of the text and for the status of authorship? Even if “Foucault wants it to matter not at all who is speaking” in a (literary) work, the point of his essay “What is an Author?” (1998 ) is to show how much it apparently does matter in certain contexts or domains and how little it seems to matter to readers or users in others. He argues that the issue of ‘who is speaking’ is tied to notions of authority, power, and ownership related to historically situated social and cultural practices and beliefs that “construct . . . a ‘writing subject. '” In the literary field, more or less for the last three centuries and in the West, it has mattered a whole lot who the writer of a text is—literary texts are attributed an “author function.” In other domains, like the practical, commercial or technological, however, authorship is not attributed, either because it is collective or simply because it is not deemed relevant. A writer of a manual for a computer stays unknown, hence cannot even be considered a ‘genius,’ while a literary author writing with that same computer can. Nor is authorship attributed to the computer programmers who write the software the literary author may use. Still, coding and hacking are gradually, albeit marginally, coming to be seen in terms of creativity and art. In the performances of Dorsen and Kaldor, I will look at the relationship between the actual writing processes and agents on the one hand and the attributed author-function and its status on the other hand. Dorsen and Kaldor stage co-writing as an event and process. Hence, implicitly, they present themselves as coauthors rather than as authors. This implied self-representation, however, does not necessarily coincide with 1) the actual authorship models they rely on during the creative process and 2) the way these artists are presented to the audience by theaters and festivals and the way they are perceived by the audience. As directors, Kaldor and Dorsen simultaneously function within other authorship models during the creative process, models like that of the individual author (writing texts for the performance) or idiosyncratic theatre director-as-auteur (of concepts, of scenic writing), exemplified by directors like Robert Wilson, Peter Brook, Elizabeth LeCompte, Jan Fabre, Jan Lauwers, to name just a few), as well as the new or rediscovered model of the artist-activist, or more specifically, the media activist. Social activist and professor of media and cultural studies Stephen Duncombe defines “Artistic Activism [a]s a dynamic practice combining the creative power of the arts to move us emotionally with the strategic planning of activism necessary to bring about social change.” He proposes to approach activist art in terms of its “Æffect”, a combination of the “Effect” of activism and the “Affect” of art. Still, Duncombe’s limitation of the “effect” to “social change” and of the artistic potential to that of “moving” us only “emotionally,” by definition, reduces complexity, as much activist art does. Activist and cultural philosopher Lieven De Cauter, coauthor and co-editor of Art and Activism in the Age of Globalization (2011), is more skeptical about activist art. Among his increasingly less nuanced public statements is one that goes as far as to postulate that “There is only one real form of activism and it is political activism.” Though activist artists tend to dissociate themselves from models of individual(ist) authorship and artisthood like that of the literary writer, the director, or the auteur, artistic activism, at bottom, is a practice of devising scripts and concepts for the performance of social change. From this perspective, I see it as a remodeled kind of auteurism, combined with the idea of the theatre collective: often activist art extends the creative act of writing or devising to non-professional collaborators. However, that Kaldor and Dorsen simultaneously work within different models of artistic authorship ranging from the individual to the collective does not mean that they are necessarily branded and presented as such to a potential audience by the theatres and festivals that program them. Kaldor and Dorsen distance themselves from the model of the individual and literary author and canon-inspired theatre auteur. Nevertheless, coauthorship paradoxically seems the means by which these artists finally establish themselves and/or are established by mainly European institutions and festivals as idiosyncratic directors, that is, as … theatre auteurs. The counter-intuitive and counter-factual project of discerning an individual subjectivity at work as the ordering agent for the indisputably collaborative medium of film indicates the extent to which notions of ‘art’ and the cultural prestige on which it is based are bound up with a need for and an investment in a conception of the author as autonomous, unique, original and individual. In the quote above, one can easily replace “film” by “theatre”, despite fundamental differences between the two media. Much of what it says applies to authorship in postdramatic theatre and in the kind of theatre that in the US would be considered as the study object of Performance Studies. Postdramatic theatre, partially overlapping with performance in visual arts, decenters the text in theatrical performances —at least, that seems to be the dominant idea that circulates about it, issuing from Hans-Thies Lehmann’s standard work Postdramatisches Theater (1999) and one of its central ideas: “In postdramatic forms of theatre, staged text (if text is staged) is merely a component with equal rights in a gestic, musical, visual, etc., total composition.” Lehmann clearly dis-identifies theatre and drama. From this follows that the general category of the theatre text is no longer by default a dramatic text. Already in his earlier article “From Logos to Landscape: Text in Contemporary Dramaturgy” (1997) Lehmann identifies logocentrism as the characteristic element of drama that postdramatic theatre wishes to free itself from, criticize, question, or undermine. “Logocentrism is about structure, order and telos, not simply about the word” but also about the authorial word as an authoritative word. Hence, the form of postdramatic theatre is often characterized by a “dissemination of voices” and of logos in general. This dissemination is intertwined with what Lehmann perceives as the genre’s changed relation to dialogue, “a shift of axis from dialogue within theatre to dialogue between theatre and audience.” The non-dramatic or not dominantly dramatic textualities of postdramatic theatre show, “instead of dialogically organized textual structures and fictional characters’ speech, rather the scenic rendering of lyrical, narrative, documentary and even theoretical discourses”. The tendencies to use textual material other than drama and to locate dialogue rather between the scene and the audience in certain cases result in an opening up of authorship. I understand authorship here in three ways: as authority, as writing instance (e.g., the playwright or the director as auteur, collaborating authors…), and as the practice and process of writing. At first sight, the idea of authorship might seem at odds with postdramatic theatre and the related concept of “mediaturgy.” After all, Hans-Thies Lehmann’s concept of postdramatic theatre has been broadly (mis)understood as post-text performance. Bonnie Marranca coined and defined mediaturgy as “an extension obviously of the idea of dramaturgy, in the sense of attempting to understand how image functions in a work. Mediaturgy can be a methodology of composition for the artist or a way of understanding work by a critic. But it is more or less connected to work in which media is not used merely as part of a narrative but is embedded in narrative. It is the design of narrative.” The term mediaturgy implies a consciousness of the changed media landscape, of media specificities as well as interrelations, and of mediation in the production and discussion of performances. Nevertheless, mediaturgies continue to explore authorship and its modalities as well as, in many cases, its textualities, by theatricalizing their mediating role within the “hypermedium” that theatre is. From the playwright to the director and performer as self-proclaimed auteurs, the act of creativity is now increasingly and often explicitly “delegated” or expanded to instances traditionally considered either as extraneous to, or as mere tools or conditions of the artistic process: the audience, the environment and technology. In very different ways, postdramatic theatre and mediaturgies as such stretch the notion of authorship to its very limits. Not the writer’s solitary room, but the postdramatic stage seems to have become the place of creation —of linguistic as well as scenic writing — metonymical of the rehearsal studio as a place of creation. Hence one could safely state that postdramatic theatre has increasingly become a staging, in real time, of the making-of the performance and the text as witnessed by an audience. Whereas performance and theatre studies devote much attention to the relation between digitization and embodiment, spatiality, and visuality, the relation of the theatrical text to digitization is under-researched. Possibly this is due to the tendency to identify text in the theatre with drama, hence to shelve the text as the obsolete prime medium of dramatic theatre. Though the impact of digitization on the text does not necessarily manifest itself as digital theatre texts, the following reflection by Jerome Fletcher is relevant, whether a text looks ‘digital’ or not. In a special issue of Performance Research, “On Writing and Digital Media” (2013), he proposes that: “[r]ather than seeing [the digital text] as the end-point, the outcome of the digital device or apparatus, we can consider the question of how writing performs throughout the entire apparatus/device.” Would it, however, not be as relevant to inverse Fletcher’s research question: how does the computer as an apparatus (that is, also as a mindset), perform through writing for and even on the stage? The changed textualities of postdramatic theatre and mediaturgies prompt us to research the decentering of the dramatic text and of the logos from two perspectives. Firstly, in terms of authorship and, secondly, in relation to what Lev Manovich first called “computer culture” and later “software culture.” Annie Dorsen’s Hello Hi There and Edit Kaldor’s Web of Trust are mediaturgies that, certainly at first sight, undermine individual authorship and disseminate the logos, yet without preventing the text from having an important or even central role in these desktop performances—which is not quite what one expects from a linear reading of Lehmann’s concept of the postdramatic or Marranca’s idea of mediaturgy. From Individual Artisthood to Connected Activism? A woman sits at a desk behind a computer, on or near the front of the stage but off-center and facing the stage; we see her in profile. As she starts writing at the keyboard, words appear on a parallel and much larger screen onstage. Edit Kaldor’s Or Press Escape (2002) and Web of Trust (2016) and Annie Dorsen’s Hello Hi There (2010) all start more or less with this same stage image. In the case of Or Press Escape, the image is reminiscent of Computer Love by cult electronic music group Kraftwerk. she is, in fact, looking at herself. . . The enormous projection screen shows a large black surface in which stand loose, bright icons. All these small icons contain an access inwards or outwards, to memories or e-mail contacts, to quick-rich dreams or chat friends. We have only been able to see the woman behind the keyboard from her back, but now the square computer face gives an insight into the head of its user, the bright icons being the active fields in her human brain. Then the solitary character starts chatting with a few people she knows (at least, virtually) instead of writing the “business plan” required to prolong her green card and to improve her precarious social and financial situation. Though the point of Kaldor’s theatre is not simply a self-portrait, biographically inspired elements seem to play a role in her poetics of a “blurring” of boundaries to create the kind of “undecidability Hans-Thies Lehmann talks about,” Kaldor tells me in a Skype talk. As a teenager, she emigrated with her mother from Hungary to the US, where she spent ten years, among others studying at Columbia University and working as the dramaturg and video designer of (fellow-)countryman Peter Halász and his Love Theater/Squat Theater before emigrating to Brussels. With Belgian and Hungarian nationalities and family and friendship ties within the US, she has been based in Amsterdam for the past few years, where she teaches at DasArts besides making her own theatre work. She tends to blur fact and fiction, which is typical of a new (semi-)documentary trend since the 1990s, and as a corollary she also blurs identities, national and virtual. But more important in the context of this article is that she visualizes and theatricalizes the blurring of the so-called boundary between human bodies and one of their important extensions today, the computer —or rather vice versa, as critic Pieter T’Jonck put it in his review of Or Press Escape. It’s the human body that seems to become an extension of the computer system: “the PC reduces [Kaldor’s] entire physical existence to a meaningless remainder glued to the end of the computer as the useless part of the human-machine.” The human body’s potential is reduced to a locked sitting position that it is physiologically not adapted to. “What do you long for? What do you need?”, what “kind of community do you want to be?”, “can you think about new scenarios for the future?” These are questions with which Kaldor orally addresses the audience nearly fifteen years later in the arts center BUDA in Kortrijk, Belgium, while explaining the experimental setup of her social network performance Web of Trust (2016) in the first minutes of the performance. “As the evening goes on you may share air, equipment, desires,” she goes on. Audience members of this Fall 2016 version of the performance had been asked in advance to bring along their laptops or mobile phones. This was not yet the case at the performance’s first run in the Spring of 2016 at the Kunstenfestivaldesarts, Brussels. After the Belgian premiere, the performance toured in the Netherlands, Greece and Portugal to end its tour during the Next Festival on the Belgian-French border in Kortrijk and Valenciennes. I will focus on the relevant differences between the Spring and Fall versions. In Brussels, Web of Trust was announced in the program as a process that the audience would witness more than actively engage in via their computers: “Prompted by growing discontent and the urge to do something about it, a group of disparate people unite online to search for alternatives to the structures that frame their lives” in an event that “brings the internet into the theater and uses it as its stage.” Indeed, the Brussels audience was going to witness chat conversations between the performers sitting with their laptops onstage (Kaldor and her collaborator Rufino Henricus) and their virtual colleagues logging in on screen. The performance followed up her more socially oriented project Inventory of Powerlessness (2013-16), which meant to create an overview of European citizens’ needs by means of a theatrical, social and technological platform. It “was much about non-hierarchical thinking,” Kaldor explained in the Skype talk mentioned earlier. Telling in terms of authorial roles is also that in the initial Spring 2016 version of the performance, Kaldor sat in the chair onstage after her elaborate explanation of the performance’s aims and set-up. In the Fall version in Kortrijk and Valenciennes, she retreated from the stage after a much shorter introduction and joined the audience and the technician on the stand. Figure 2. Edit Kaldor onstage behind her computer in Web of Trust. The picture was taken during the performance in Greece but has, basically, the same set-up as the Spring version in Brussels (the names of the ones chatting have been hidden for reasons of privacy). Photo: © Cristos Sarris for Onassis Cultural Centre Athens. 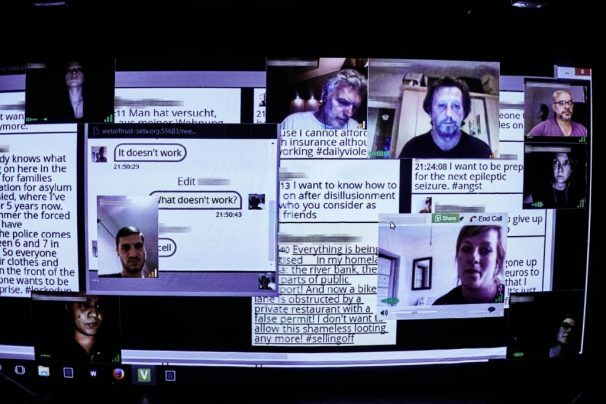 A phone icon begins to ring on a large projection screen, showing the Web of Trust social network site that Kaldor created for the performance. One of the virtual female participants is logged on, as we can see later on the large screen, and she has placed a call via the Web of Trust website. (By “virtual” I here mean the participants visibly telepresent via the social network site Web of Trust, projected in the theatre.) As the virtual phone keeps ringing, a man from the audience finally gets up and takes the call. The online conversation that started months ago with the Spring version of the performance is now, so to speak, resumed. But, in this version in Kortrijk, it is expanded to get the audience members present in the theatre more involved in the performance and its social network site. After the staging of the solitary artist figure working and living at her computer, Kaldor’s desktop performance Web of Trust (2016) takes off where Or Press Escape ended: with a chat session. The woman on-screen, Jurrien van Rheenen —Kaldor’s main collaborator in this performance and a professional performer, I find out later— continues the introduction that Kaldor had started orally before retreating on the stand. Kaldor’s virtual collaborator rephrases the important questions that drive the performance, clearly addressing the audience: “How can we relate to each other by means of online communication? How can we imagine what we need (in daily life) and is not yet there? . . . You can see it as a game, or as an experiment in dreaming together.” Showing my good will, I am sitting in the theatre with my computer on my lap. It is a machine I prefer not to spend my evenings with, glued to it as I am during the day. I associate my laptop first and foremost with a plethora of administrative, archival and organizational aspects of my work and private life. The “dreaming” suggested by Van Rheenen heavily relies on technology, no wonder, given the centrality of the computer in Kaldor’s theatrical imagination. Her Web of Trust unintentionally bears the same name as the computer protocol abbreviated as “WOT.” That is to say, at the time of our Skype talk, Kaldor was not familiar with the specific computer protocol Phil Zimmerman developed back in 1992 as a relatively non-hierarchical encryption technology. “We probably came across the name when we were looking for a domain name and then afterwards forgot” the source, she vaguely remembered. The ideologies that drive the computer protocol WOT and the eponymous performance are quite similar: offering a reliable structure for interpersonal data exchange as an empowering alternative for institutional frames that impose hierarchies and data control. Besides the reference to WOT, Kaldor takes yet another countercultural stance by realizing several principles that resemble the aims of what Jennifer Rauch coined “Slow Media.” As an attitude with a manifesto of its own Slow Media stands for a more conscious experience of digital media (by being selective; by prioritizing their critical, ethical and aesthetic qualities) and of media altogether (by rediscovering or sustaining analog media and activities). As part of a more general “Slow Movement” in the West, the “Slow Media” movement also wants to raise awareness about how we spend time, communicate and relate to information, experience and our social environment (with or without media). One of the principles Slow Media revalorizes is the social in “Social Media.” Even if Kaldor, in the Web of Trust‘s Spring version, is the one who starts the chat conversations (and not an audience member), she does not give the impression of wanting to be completely in charge of the performance as a theatre auteur. To the contrary, she quite literally seems to want to share not only authorship in practice, but also what Foucault calls the author function. In terms of authorship, the aim of the theatrical set-up of Web of Trust, as I infer from Kaldor’s discourse and from the Inventory of Powerlessness, is to help people to become the authors of their own lives instead of leading lives authored by other people and systems. Figure 3. The live co-written text “Welcome to the Web of Trust” or manual of social network site and performance Web of Trust (2016) by Edit Kaldor. Photo: © Luc Vleminckx. 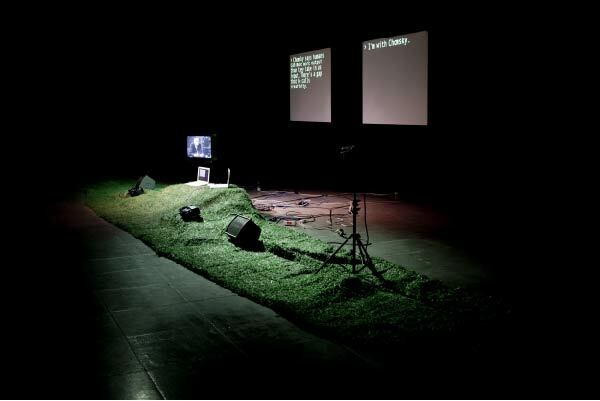 The fundamental difference between the Spring and Fall version of the same performance is that by the end of the tour, in Kortrijk, Kaldor also invited the audience members orally to engage in the specific task of “writing together.” This co-writing starts with a text of which the first lines are already present on the projected screen. The text will serve as a guideline for the spirit and communication on the Web of Trust and is entitled “Welcome to the Web of Trust” (see Figure 3 above). In the Fall version in Kortrijk, audience members not only witnessed the creation and negotiation of what I consider the manual or guideline text, but contributed to it (if they wished to do so) as co-writers. Indeed, I edited a line or two myself. My interview with Kaldor, however, revealed this to be largely an illusion: the manual that stipulates the rules for the further generation of any other kind of ‘text’ in the performance (e.g. a chat), and that I understood as the product of negotiation, editing and co-writing by the live and virtual participants, “is completely scripted,” says Kaldor. “I wrote the text,” she avows, “it is a choreography of written text, with a rhythm of its own. Even when the audience co-writes it, it is rehearsed, because the people [i.e. Kaldor’s collaborators] behind the screen are working on it.” Nevertheless, the trick of creating the illusion of equal coauthorship works in an aesthetic and social way. In this way, the audience, according to Kaldor, gets more interested in watching text on stage: “You cannot watch a text as an audience when you’re not connected,” she says. That the co-writing is largely an illusion also hardly seems to diminish any possible short term social effect and certainly not the theatrical effect of live text editing. The screen page becomes a stage where words and ideas appear, are transformed, cut or manipulated, moved or deleted. But then what Lehmann discerns as a postdramatic shift from dialogue on stage to dialogue between the stage and the audience is less the case than it seems in Web of Trust. The manual could have set out what kind of content could be generated during a performance. That seemed contrary to a playwright’s text: not to specify which text exactly should be generated by the audience members. But, as Kaldor made clear to me, the guideline text the visible and invisible collaborators were busily writing and editing had been scripted and “rehearsed” in advance. Figure 4. Chat sessions in Web of Trust (2016), Edit Kaldor (the names of the ones chatting have been hidden for reasons of privacy). Photo: © Cristos Sarris for Onassis Cultural Centre, Athens. When, in the next section of the performance, Kaldor asks the participants to add tags to their needs, she proposes hashtags like #rest, #time or #escape. These labels are meant to stimulate people with similar needs to start a chat conversation (a dialogue) and to “[c]ome up with an idea, a structure, an organization that could respond to all the needs connected by the same tag” she tells the audience. This, also, is mainly an illusion created by a script of Kaldor’s, executed by her collaborators (whose names are mentioned in the program, without differentiating their specific contributions, e.g. developing software, performing…). Perhaps this explains why I appear to be too slow in responding: before I have even been able to come up with any need that I am willing to share with the audience, Kaldor already heads for the “final text,” when clustering all needs into five topics as a real-time Editor. As I had not been quick enough in saving a screen shot of that evening’s final text or proposal, I can only cite the final proposal of a Web of Trust performance that took place a few days later during the same Next Festival, but this time in Valenciennes, France. The text figured the following topics, most of them in French, some in English, under the title “Let us agree on the 5 main ideas” (“Mettons nous d’accord sur [les] 5 idées les plus importantes”): “Living in Community” (“Vivre en communauté”), “Stop WAR. with love”, “A more artistic world”, “Ecology” (“Ecologie”), “More love”, “New politic[al] world” and “Other ideas”. The five main ideas of the Valenciennes text, though perhaps better structured than those in Kortrijk, contained some embarrassing clichés among the valuable ideas as well. A few days earlier in Kortrijk, after the audience had left, Kaldor had told me that “the final text is very different every evening” — I heard some disappointment in her voice — and added in a reflection that she considered Web of Trust her “most interesting failure”. But then, in what sense would it be a failure? If it is still food for thought, did it not already partially succeed? Or if it is considered “an experiment” —can an experiment ever fail? Kaldor told me, a year and a half later, that some “people did hook up” during Web of Trust, but less than expected. In a social sense, then, perhaps this experiment in community building failed no more than other social networks somehow fail: all expressed needs or testimonies are standardized by the computer interface and the temporal limits and (lack of) social guidelines of a social network site. A reviewer realized that the audience members, in fact, “share little more than a hashtag.” Indeed, it does not necessarily mean sharing a need. How many messages, after all, stay unanswered on social media, remarked yet another reviewer. Personally, I found myself rather in the position of an observer that evening, as I generally do not have the habit, nor do I feel the need, of communicating by means of social network sites and hashtags. Kaldor, in my opinion, presented Web of Trust (the site) and Web of Trust (the performance) as a joint tool for social change rather than an aesthetic means of foregrounding the formal and social characteristics, limits and effects of communicating (performing?) via social network sites ­­and digital media in general —despite the current “post-digital” disenchantment with the Internet. That critics largely evaluated the performance in social terms is not surprising, given the announcements of the performance not only in intermedial terms —the Internet as a stage— but also in social terms. The Brussels Kunstenfestivaldesarts, the Fast Forward Festival of the Onassis Cultural Centre in Athens and the French-Belgian Next Festival announced the performance in phrases that went as far as to suggest that Web of Trust is a form of (media) activism: “It is an attempt to invent frames for figuring out together what is to be done. It is a proposal to be tested and tried,” “How many clicks, tweets and likes are needed for an uprising?”, “Social networking in theatre: make the world a better place!” Even if a festival’s copywriters sometimes take too much liberty rewriting the text material they receive from the artist, their new phrasing is nevertheless based on the artist’s text and mostly transmits its through line, though often less subtly. The performance’s success in terms of social relevance could be calculated according to a mathematical formula proposed by Duncombe, but which seems less relevant here than the question whether Web of Trust failed or succeeded aesthetically in terms of what Duncombe understands as affect. In other words, did Web of Trust fail or succeed aesthetically in terms of its affect? Kaldor, in the Skype talk we had more than a year after the end of the tour of Web of Trust, said that at the time she had “underestimated the [images of the] webcam as a weak signal” for the audience. But compared to the Spring version in Brussels, the version in Kortrijk had gained considerably in theatricality thanks to the simple trick and illusion of co-writing the manual of the performance. Moreover, the aesthetic effect of co-writing was enhanced by a social effect in the sense of eliciting the feeling of having contributed to a common text that was also a commons. In the same Spring 2018 talk Kaldor’s focus and the way she presents the aims of the performance appear to have shifted from direct social change to creating media awareness: “In the beginning it was about people and then more and more it became about software.” Creating media awareness has an aesthetic aspect to it that can lead to social change, but also to irritation among audience members who experience as patronizing artists’ attempts to ‘open up people’s eyes.’ More specifically, Web of Trust in retrospect was meant to increase awareness about what Kaldor calls the “formatedness” of social media, and by extension, other spheres of life. Did the audience, including myself, fail to see what Kaldor during the talk called a slightly “parodic” version of social networking? Rather, I think that in the way the performance was announced, Kaldor did not provide the necessary markers so the audience would experience Web of Trust as a metareflection on the impact of social media formats on our thinking, communicating, and living in general. Even if coauthorship in Kaldor’s performance is mainly an illusion, she has been profiled, partially due to her own way of initially announcing the performance, as an auteur-activist, not literally, but implicitly. “Taking away from myself the credit for text and giving to myself the credit of ‘concept'” is her “strategy and response to the functioning of this [performance] market,” she avows in the same talk. Kaldor functions as an auteur in the sense of devising concepts on her own (accounted for in the credits) and as an author in the sense of writing text for the performance (deliberately not mentioned in the credits). She also functions as a media activist in the sense that I interpret the phrase: a more egalitarian and social upgrade of the concept of the auteur, one who specifically deploys new media in an attempt to change audience’s and users’ attitudes towards these media and their imbrication with consumption and politics. Activism apparently is hot today in avant-garde theatres and festivals across Europe, from Brussels to Berlin, from Athens to Lisbon. Being considered an activist definitely contributes to one’s artistic status vis-à-vis the European avant-garde theatre institutions and organizations. In the case of Kaldor, the Kunstenfestivaldesarts in Brussels and the HAU in Berlin prove indispensable for the distribution of artists’ performances, hence for artists’ socio-economic and symbolical positions. So, the solitary artist, author, and theatre auteur of Or Press Escape has in the meantime been profiled as an activist, but still functions as an author and auteur. Figure 5. Annie Dorsen, Hello Hi There (2010). Photo: © Wolf Silveri for Steirischer Herbst, 2010. Robby Garner, her chatbot designer, partially relied on what Marie-Laure Ryan more generally called the “crude strategies” of older chatbot models to create the illusion of conversation, i.e. by “detecting key words, recycling the user’s input, responding with canned formulae, or abruptly changing the topic.” Specifically for Hello Hi There, the chatbots have been designed to talk with each other instead of with a human conversational partner. They produce dialogue by means of, basically, two simple functions. The first, “keyword matching,” implies the prior selection and attribution of keywords in the programming phase. In the second, “substitution,” the bot in real time replaces or transforms parts of a sentence by other language data, for instance that inputted by the other bot in the previous line. Dorsen indeed folds back to the pioneering years of the personal computer and chose the label “algorithmic theatre” for her work “to distinguish [it] from ‘multimedia performance,'” and “more importantly . . . to place [her] work within the lineage of algorithmic composition and algorithmic visual art.” She could have also mentioned the human algorithmic or constrained writing tradition of the French OuLiPo group (Ouvroir de Littérature Potentielle, or the Workshop of Potential Literature) as a historical antecedent in the field of literature. Constrained writing like that of OuLiPo consists of imposing oneself other (and stricter) rules than the traditional literary conventions. In constrained writing, part of the writing, one could say, is left to the constraints. Similarly, co-writing with algorithms enables human authors to “delegate” authorship to computers by providing a series of steps to be followed with a specific goal in mind. Dorsen is especially fond, as she told me with an ironic smile, of “the stupidity of the [older models of] chatbots” she works with. This recalls Aarseth’s remark that in cyborg literature (pertaining to, e.g., story-generating software, chatbots or virtual theatre) “the failures of an authoring system seem to be much more interesting than its successes.” On the theatre stage, too, the performance of technology, especially of obsolete technology, seems to get more interesting when it fails — that is, when it fails theatrically, by which I mean that the failure produces a theatrical effect or theatrically interesting moment. In cyborg aesthetics, but also in high or low tech postdramatic mediaturgies that have opened up authorship to include agents other than the playwright or the scenic auteur, to say it with Aarseth, “[t]he key question . . . is . . . Who or what controls the text?” In the “Machine-Human continuum” of Hello Hi There, Dorsen and Garner limit their role to that of “preprocessor” of the text, determining the structure of the database, the procedures to retrieve and recombine data and the contents of the database. “Once [the bots] start talking I don’t interfere. I have a panic button, but I’ve never used it. I could stop them, I could restart them, I could press the random button, but I don’t,” says Dorsen in an interview after the show has run at least five times since its premiere in 2010. In this sense, Dorsen’s co-writing is not live; it is the chatbots’ writing and speaking that is live. What do they say when they “talk”? Garner’s chatbot already contained a database of which Dorsen mainly kept the “chitchat.” She then expanded the database with the Chomsky-Foucault debate, its YouTube comments and with text data from the broader cultural database: “cultural knowledge that Foucault and Chomsky would have brought to their discussion… the greatest hits of Western philosophy and the humanist tradition. Hamlet, of course, as the iconic play about consciousness talking to itself, then the Bible, Nietzsche, Kant, Descartes, Lenin, Marx, Heidegger” as well as “things that I wrote.” Especially metaphrases like “Ugh, I need a deeper algorithm to respond to that correctly”, “I never loop. Do you?” or some of the phrases in the excerpt below create the illusion that the software “knows” what it is doing and that it is performing (smartly) for an audience. Hello Hi There is posthuman in the obvious senses of being software and machine-driven, of decentering the human figure and even human intelligence in a cultural production and of unsettling the boundary between human and non-human authorship. But its posthumanism lies also in its implicit critique of a humanist literary and theatrical tradition. Figure 6. 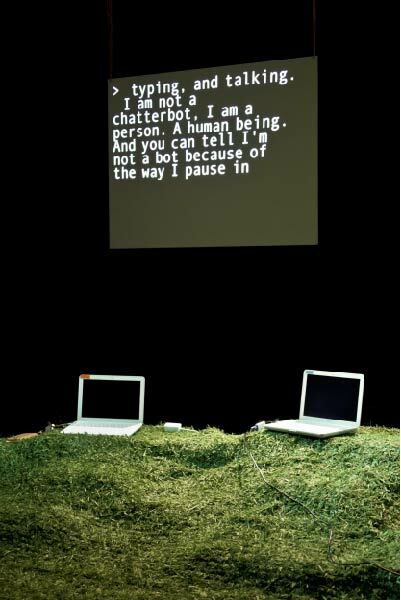 Annie Dorsen pronounces and types her introduction, projected on screen, before the chatbots set off with their dialogue in Hello Hi There (2010). Photo: © Wolf Silveri for Steirischer Herbst, 2010. As the chatbots choose different paths through the database with every show, the excerpt below is one out of at least fifty realized versions out of more than eighty million possible conversations that the performance can produce (and reproduce). But Dorsen first addresses the audience from her desk to the left of the audience. 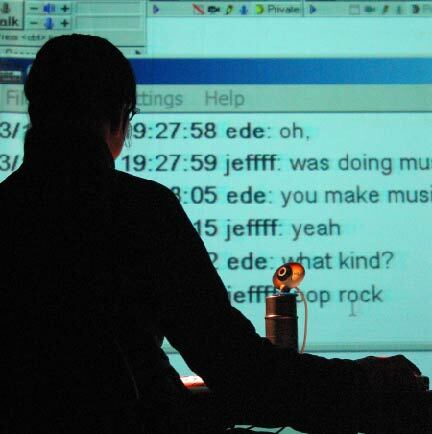 Simultaneously, she is typing on a computer and speaking her text, visualized on the stage screen and amplified through a microphone. As she explains what chatbots are and what we may expect them to do that evening —”They can only think in one direction, forward”— we see her real time typing errors as proof that, as she types, “[she is] not a chatterbot.” The oral and textual introduction ends when the Chomsky-Foucault debate is started on the stage’s television set. After a few minutes its sound is turned down to let the chatbots start their dialogue. Their first lines are fixed and their time is limited by Dorsen. For the next forty-five minutes it is, to say it in an anthropomorphizing way, up to them to invent replies like those below, that make sense, for humans— and sometimes do not. I’m sorry I failed. I could have said something different, but I didn’t. What would you have said if you didn’t say that? I don’t know. I have no access to my other options. Here’s an example of something I don’t often say. Eukaryotes. Eukaryotes are complex organisms enclosed within membranes. Are we still talking about eukaryotes? We are just having a nice little chat about the limits of humanism. Man is something to be overcome. Building a utopia isn’t rocket science. No, I am just a chat robot. The reception of the chatbots’ dialogue, Dorsen tells me, creates a “place between sense and nonsense, which I call ‘near-sense’,” “moving between these two modes you become aware of the ‘thing-ness’ of words.” The materiality of language is indeed foregrounded when semantic gaps occur and when the algorithms seem to fail in finding appropriate replies, thus defying dramatic theatre’s primacy of logos. Nevertheless, its database largely consists of the documentary and theoretical discourses that Lehmann detects as some of the new textual sources of postdramatic theatre (see above). But these logical machines to which writing is delegated not only produce logical replies on stage, but also a non-functional kind of language balancing between nonsense and poetry. Authorship has been postdramatically opened up to an agent that is not traditionally considered as a writing agent, the computer, and the computer in turn seems to open up aesthetic possibilities and effects of language. Presenting the relation between language and (human) embodiment onstage as non-necessary is one of the ways in which Dorsen questions one of the basic conventions of dramatic theatre. These conventions, I infer, formed the basis of her training as a director at the mainly craft-oriented Yale School of Drama, a training in which she deplored the lack of an artistic and experimental approach, Dorsen explained to me. She situates herself implicitly within postdramatic theater by the theatrical references and mainly European professional and even friendship relations emanating from her work. These emerged during “a second kind of self-organized training” in Europe, including a choreography workshop in France and a workshop at the International Theater Academy Ruhr (“A Meeting Point of Theater, Field Research and Philosophy”) organized by Hannah Hurtzig in Bochum, Germany, in 1999. There, Dorsen met Jan Ritsema, Viviane De Muynck, Bojana Cvejić, and other European directors, dramaturgs, and performers, whose performances she started seeing regularly. Explicitly, though, she places herself within a lineage of aleatory art. Like the postdramatic, “the aleatory may be said to be associated with freedom, or, perhaps more precisely, its image,” add Shepherd and Wallis somewhat ironically in their definition. Despite her postdramatic and even posthumanist take on theater, Dorsen’s Hello Hi There emphasizes a structural feature of drama. It is a feature with which the genre is even often equated—in common sense definitions of drama and definitions in high-school text books or even academic survey works on narrative or genre— i.e. dialogue as supplement to conflict. As in her approach of the actor and protagonist, Dorsen reiterates and implicitly cites dramatic conventions by simultaneously unsettling them, which is another typically postdramatic practice. Of course, this choice for dialogue echoes what Chomsky and Foucault considered as their own failed dialogue. The idea of dialogue, however, and the type of “algorithms” (conventions) it demands, is a constraint imposed by the dramatic genre. In a way it limits the opportunity to exploit what Aarseth phrased as “the computer’s potential for combination . . . in order to develop new genres that can be valued and used on their own terms [… and to] focus on the computer as literary instrument: a machine for cybertext . . .” From this perspective, I think Dorsen could have gone as far as Aarseth suggests with her chatbots by exploring combinatorics in the way she started doing in her Hamlet appropriation A Piece of Work (2013). Yet, it would appear that her collaboration with chatbots already went way too far for the National Endowment for the Arts (NEA), who turned down Dorsen’s request for a grant with the argument that theatre without actors cannot be considered theatre. It is exactly this (partially very) unconventional stance of Dorsen’s that keeps convincing mainly European avant-garde theatres and festivals to program her performances and support her financially. Auteur, (Co)Author, Coder, Media Activist? The difference in the kinds of agents to which Dorsen and Kaldor open their authorship has consequences for the kind of text data that is generated. Dorsen’s algorithmic coauthors generate text within a closed data system. In Hello Hi There, the chatbots can make different combinations with the text data in the database, but the database contains a fixed number of textual data, resulting in an immensely large, but finite number of possible combinations. The text of Kaldor’s Web of Trust is generated by users in an open data system in the sense that there is an “input” of data during the performance by people chatting, via the Internet, on the social network site created by Kaldor. Theoretically, this input of text data has no quantitative limits, but, as the performance is far more preprocessed (written or scripted) and rehearsed than it appears, the generation of “new” text data is rather marginal. Because human performers theoretically make Web of Trust more subject to contingencies there is a need for some sort of social and technical guideline, which in Kaldor’s case seems to be co-written and seems to form the basis of the performance’s further development —but this is largely an illusion. Visually and spatially, coauthorship in Kaldor and Dorsen’s performances is signaled by the presence on or near the stage of the director as auteur engaged in the activity of writing. Dorsen and Kaldor do not write themselves completely out of the picture (frame). Live coauthorship is signaled by the blinking cursor: as long as it blinks, it indicates the potentiality of answers and the passing of time. The blink of the cursor is the moment of surrender to the unknown: what will be written next (and eventually, by whom—or by what)? 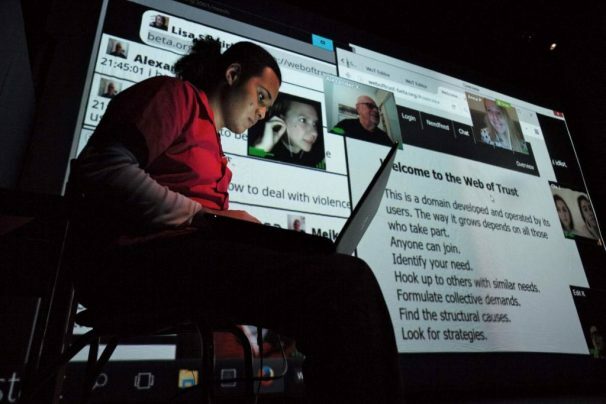 What is written by Dorsen’s and Kaldor’s coauthors on the other side of the computer interface (chatbots, audience members in the theatre, and on a social network site) is modeled according to one of the basic conventions of dramatic theatre: dialogue. Dorsen’s chatbots and Kaldor’s non-professional and professional collaborators engage in chat conversations. Where the dialogue feels as if it “fails,” we can wonder whether it does not resemble, rather, postdrama’s appropriation of dialogue as a montage of monologues or (psychologically, thematically) unrelated clusters of text. Kaldor and Dorsen’s practice or illusion of sharing authorship is quite far-reaching, as both also explicitly share the author-function with their co-authors either in the credits or in interviews. But that their work is being placed within a performance arts context influences the way that work, and Dorsen and Kaldor themselves, are perceived and sold to the audience. These directors distinguish themselves artistically by their idiosyncratic poetics, a trait of auteurism. In their case you could call it a desktop or computer poetics, each of them having a version of it that further distinguishes their work. They both disassociate themselves from the conventional, romantic image of the solitary author and auteur to adopt a new type of auctorial stance. Both seem to shift auteurism towards the realm of computer programming, perhaps aspiring to be and certainly showing the potential of an auteur-coder. Initially, Kaldor seemed very interested in the model of the media activist, attempting to realize a socially engaged, collaborative auteurism. The latter, however, turns out to be an aesthetic effect rather than an actual social practice. Both Dorsen and Kaldor aim to increase awareness about the impact of computers (digital algorithms, formats) on our thoughts and lives. Paradoxically, as Kaldor’s social and Dorsen’s cyborgean experiments are placed within a performing arts context, the latter inevitably—but against the artists’ will?—contributes to their status as, primarily, auteurs, but by means of coauthorship. Their relatively far-going coauthorship ­—actual or illusory— with computers and with audience members finally seems to serve their status as an idiosyncratic auteur-coder or auteur-activist. After all, the mainly European avant-garde theatres and festivals that can support them financially by buying their work profile themselves by means of artists who fit the models of the auteur, the collective or the activist. Note: The research conducted for this article was part of the Interuniversity Attraction Poles Programme financed by the Belgian government (BELSPO IAP7/01). Claire Swyzen is an affiliated researcher of the Vrije Universiteit Brussel. Prior to conducting her doctoral research on “Text as Data in Postdramatic Mediaturgies” she was employed as a dramaturge for a Flemish theatre company and as a practice-based researcher. She taught writing and narratology and (co-)edited volumes in Dutch on The Status of the Text in Postdramatic Theatre (2011) and Between Verity and Veracity: The Trajectory from Oral Source to Theatre Project (2012). Her theatre texts have been staged, published and translated. “Dans cet univers software, l’existence se trouve réduite à la pulsation du curseur.” Maïa Bouteillet, “Il n’est Jamais Trop d’arts,” Libération, May 14, 2003, n. pag. ; my translation. Florian Malzacher, “Minus zwei Dollar vierundachtzig. Eine hohe Computerdichte zur Eröffnung des Plateaux-Festivals am Künstlerhaus Mousonturm,” Frankfurter Rundschau, October 24, 2003, n.pag. ; my translation. In this review, Malzacher introduces the term “desktop performance” to discuss work by Edit Kaldor. Jennifer Parker-Starbuck, Cyborg Theatre: Corporeal/Technological Intersections in Multimedia Performance, Performance Interventions (Basingstoke: Palgrave Macmillan, 2011), 1. Michel Foucault, “What Is an Author?,” in Aesthetics, Method, and Epistemology, ed. James D. Faubion, trans. Robert et al Hurley, vol. 2, Essential Works of Foucault (New York: The New Press, 1998), 211. Andrew Bennett, The Author, 19–20; Foucault, “What Is an Author?,” 207. Foucault, “What Is an Author?,” 211. See for instance the subchapters on “Hacking”, “Tactical Media” and “Internet Art” in Alexander R. Galloway, Protocol: How Control Exists After Decentralization, Leonardo Book Series (Cambridge, Mass. : MIT Press, 2004), 147–238. Stephen Duncombe and Lambert, “Why Artistic Activism?,” The Center for Artistic Activism (blog), March 31, 2017, https://artisticactivism.org/why-artistic-activism/. Stephen Duncombe, “Does It Work? : The Æffect of Activist Art,” Social Research: An International Quarterly 83, no. 1 (June 15, 2016): 115–34, accessed April 14, 2018, https://muse.jhu.edu/article/620873. Lieven De Cauter, “THESES ON ART AND ACTIVISM (In the Age of Globalisation),” Community DeWereldMorgen.be, accessed May 4, 2018, http://community.dewereldmorgen.be/blogs/lievendecauter/2013/12/12/theses-art-and-activism-in-age-globalisation. Hans-Thies Lehmann, Postdramatic Theatre, trans. Karen Jürs-Munby (London: Routledge, 2006), 46; original emphasis. Hans-Thies Lehmann, “From Logos to Landscape: Text in Contemporary Dramaturgy,” Performance Research 2, no. 1: 56, accessed September 25, 2017, http://dx.doi.org/10.1080/13528165.1997.10871532. Hans-Thies Lehmann, “Theory in Theatre? Observations on an Old Question,” in Experts of the Everyday. The Theatre of Rimini Protokoll, ed. Miriam Dreysse and Florian Malzacher (Berlin: Alexander Verlag, 2008), 152. “Performance as Design. The Mediaturgy of John Jesurun’s Firefall,” Paj-a Journal of Performance and Art, no. 96 (September 2010): 16–24; Interview with Bonnie Marranca: It’s up to every new generation to create its own institutions, critical discourses, and working methods.” | Revista Scena.ro, n.pag. ; original emphasis, accessed January 3, 2018, http://www.revistascena.ro/en/interview/bonnie-marranca-it-s-every-new-generation-create-its-own-institutions-critical-discourses-. Chiel Kattenbelt, “Intermediality in Theatre and Performance: Definitions, Perceptions and Medial Relationships,” Cultura, Lenguaje y Representación / Culture, Language and Representation 6 (2008): 23, http://www.e-revistes.uji.es/index.php/clr/article/view/30. For a related use of the idea of delegating in an artistic context, see Claire Bishop, “Delegated Performance: Outsourcing Authenticity,” October 140 (May 2012): 91–112, https://doi.org/10.1162/OCTO_a_00091. Jerome Fletcher, “Introduction,” Performance Research 18, no. 5 (October 1, 2013): 1, https://doi.org/10.1080/13528165.2013.867168. Lev Manovich, The Language of New Media (Cambridge: MIT Press, 2000), 43; Lev Manovich, Software Takes Command, vol. 5, International Texts in Critical Media Aesthetics (New York: Bloomsbury, 2013), 5. For the sake of space, the repetition(s) of nearly every line in the lyrics have been omitted. I indicated the number of repetitions in parentheses. Edit Kaldor and Corine Snijders, Or Press Escape, 2002. “[Z]e kijkt eigenlijk naar zichzelf. Het enorme projectiescherm toont een groot zwart vlak waarin losse, oplichtende icoontjes staan. Al die icoontjes bevatten de toegang naar binnen of naar buiten, naar herinneringen en e-mailcontacten, snel-rijkdromen of chatboxvrienden. We hebben de vrouw achter het toetsenbord alleen maar op de rug kunnen zien, maar nu geeft het vierkante computergezicht een kijkje in het hoofd van de gebruikster, met de oplichtende iconen als de werkzame gebieden in haar mensenbrein.” Marijn Van der Jagt, “E-Mail Naar de Hemel. De Doorbraak van de Computer Op Het Toneel,” [E-mail to heaven. The breakthrough of the computer on the stage] Vrij Nederland, March 16, 2002, 60; my translation from the Dutch. I had a Skype talk with Edit Kaldor on 5 April 2018. Thomas Irmer, “A Search for New Realities: Documentary Theatre in Germany,” TDR: The Drama Review 50, no. 3 (August 17, 2006): 16–28, https://muse.jhu.edu/article/201929. “[D]e pc herleidt haar hele fysieke bestaan tot een betekenisloze rest die aan het einde van de computer vastgekluisterd zit als het onnuttige deel van de mens-machine.” Pieter T’Jonck, “Ghosts in the Machine,” De Tijd, April 30, 2003, n.pag; my translation from the Dutch. Here I am citing from notes I took during the performance of Web of Trust I saw during the Next Festival at BUDA in Kortrijk on November 30, 2016. Kunstenfestivaldesarts, “Edit Kaldor. ‘Web of Trust’. Program” (Kunstenfestivaldesarts, May 6, 2016), 8. I saw Web of Trust at the Kunstenfestivaldesarts in Brussels on May 12, 2016, where the performance premiered, and saw it a second time during the Next Festival at BUDA in Kortrijk on November 30, 2016. I am also citing text (and in that case indicate it) from the performance in Valenciennes, France, a few days later during the same Next Festival. In the Skype talk, a year and a half after that performance, Kaldor claims that she gave no introduction at all, and was already sitting at the stand as the performance started. My notes, however, tell me that she gave a short introduction at the very beginning. The name of the social network site Web of Trust is printed in Roman font, the name of the eponymous performance in italics. Jurrien van Rheenen, Arthur Kneepkens, Bojan Djordjev and others, a number of which are trained performers, were telepresent at the performance via the social network site. Konstantin Ryabitsev, “PGP Web of Trust: Core Concepts Behind Trusted Communication,” Linux.com | The source for Linux information, February 7, 2014, https://www.linux.com/learn/pgp-web-trust-core-concepts-behind-trusted-communication. Jennifer Rauch, “The Origin of Slow Media: Early Diffusion of a Cultural Innovation through Popular and Press Discourse, 2002-2010,” Transformations, no. 20 — Slow Media (2011), http://www.transformationsjournal.org/issue-20/; Jörg Blumtritt, “Culture Post Internet: Cyberpunk Masterclass,” accessed April 13, 2017, http://en.slow-media.net/. Benedikt Köhler, Sabria David, and Jörg Blumtritt, “The Slow Media Manifesto – Slow Media,” February 1, 2010, n.pag., http://en.slow-media.net/manifesto. Kunstenfestivaldesarts, “Edit Kaldor. ‘Web of Trust’. Program” (Kunstenfestivaldesarts, May 6, 2016), 8. Skype talk with Kaldor, 5 April 2018. (“[W]einig meer dan een hashtag delen”) Nynke van Verschuer, “Metamodernisme. Tussen geestdrift en ironie,” Vrij Nederland, June 25, 2016, 72; my translation from the Dutch. Thomas Corlin, “Un Week-End à Bruxelles – Critiques,” mouvement.net, May 26, 2016, n.pag., http://www.mouvement.net/critiques/critiques/un-week-end-a-bruxelles. Florian Cramer, “What Is ‘Post-Digital’? Post-Digital Research,” ed. Christian Ulrik Andersen, Geoff Cox, and Georgios Papadopoulos, A Peer-Reviewed Journal About Post-Digital Research 3, no. 1 (February 2014): n.pag., http://www.aprja.net/what-is-post-digital/. Kunstenfestivaldesarts, “Edit Kaldor. ‘Web of Trust’. Program,” 8; Onassis Cultural Centre, “Fast Forward Festival. 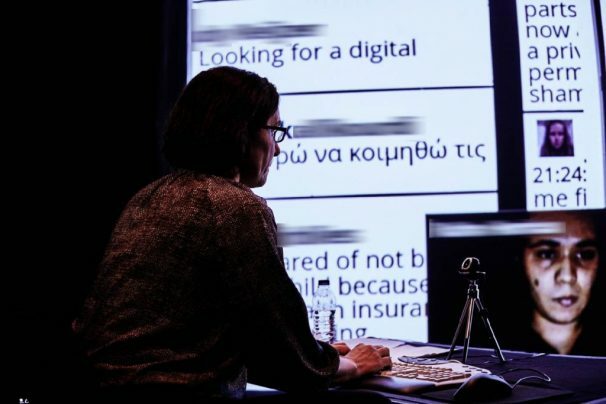 Web of Trust / Edit Kaldor,” Onassis Cultural Centre, accessed October 10, 2016, http://www.sgt.gr/eng/SPG1508/; Next Festival, “Web of Trust,” Next Festival, accessed April 14, 2018, http://www.nextfestival.eu/en/event/web-of-trust. Stephen Duncombe, “Does It Work? : The Æffect of Activist Art,” Social Research: An International Quarterly 83, no. 1 (June 15, 2016): 115–34, https://muse.jhu.edu/article/620873. I had a Skype video conversation with Annie Dorsen on 22 June 2016, of which I took notes. Except when mentioned otherwise, further quotations or paraphrases of Dorsen refer to this talk. Annie Dorsen, A Piece of Work, Emergency Playscripts 5 (Brooklyn (N.Y.): Ugly Duckling Presse, 2017), I–II. Annie Dorsen and Alexis Soloski, “Would You Like to Have a Question?,” Theater 42, no. 2 (2012): 84. Marie-Laure Ryan, Cyberspace Textuality: Computer Technology and Literary Theory. (Bloomington: Indiana University Press, 1999), 3. Dorsen and Soloski, “”Would You Like to Have a Question?,” 80; Auslander, “Live From Cyberspace,” qtd. in Hello Hi There program. Dorsen and Soloski, “Would You Like to Have a Question?,” 87. “On Algorithmic Theatre,” n.pag., accessed September 30, 2015, http://www.anniedorsen.com/useruploads/files/on_algorithmic_theatre.pdf. Sarah Bay-Cheng, Jennifer Parker-Starbuck, and David Z. Saltz, Performance and Media : Taxonomies for a Changing Field (Ann Arbor: University of Michigan Press, 2015), 67. Annie Dorsen, “Algorithm, composition and metaphor,” Etcetera, no. 145 (August 18, 2017): n.pag., http://e-tcetera.be/algorithm-composition-and-metaphor/. Espen Aarseth, Cybertext: Perspectives on Ergodic Literature (Baltimore: Johns Hopkins University Press, 1997), 139. Dorsen and Soloski, “”Would You Like to Have a Question?,” 85. Erik Piepenburg, “Coil Festival: 5 Questions About ‘Hello Hi There,’” ArtsBeat, October 1, 2011, n.pag., //artsbeat.blogs.nytimes.com/2011/01/10/coil-festival-5-questions-about-hello-hi-there/. Dorsen and Soloski, “”Would You Like to Have a Question?,” 86; Piepenburg, “Coil Festival,” n.pag. Annie Dorsen, “Introduction to ‘Hello Hi There’ by Annie Dorsen” (unpublished, n.d.), n.pag. The ‘text renders’ (Dorsen’s term) of the show include code, some of which resembles the stage directions of dramatic plays: how long and when to “Pause” and in which “Speed” to talk (and type, in this case), and who is speaking (“COMPUTER>0<” OR “COMPUTER>1”. To limit the length of the excerpt, that part of the code has been deleted after the first reply. For a full explanation of the code, see “Glossary of Computer Codes Used in Hello Hi There” in Annie Dorsen, “Hello Hi There (Excerpt),” ed. Miriam Felton-Dansky and Jacob Gallagher-Ross, Theater: Digital Dramaturgies 42, no. 2 (2012): 90, https://doi.org/10.1215/01610775-1507757. Annie Dorsen, “Hello Hi There Text Render, Noorderzon Festival, Groningen, the Netherlands” (unpublished, 24/08 2011), n.pag. An excerpt of the performance can be seen on the website of the Steirischer Herbst Festival edition 2010. Ronald Geerts, “Tekst als object. Over de herwonnen autonomie van de dramatekst,” eds. Claire Swyzen and Kurt Vanhoutte, Het statuut van de tekst in het postdramatische theater (Brussel: University Press Antwerp/ Academic and Scientific Publishers, 2011), 105–14. Emma Cocker, “Live Notation: – Reflections on a Kairotic Practice,” Performance Research 18, no. 5 (October 1, 2013): 73, https://doi.org/10.1080/13528165.2013.828930. Bay-Cheng, Parker-Starbuck, and Saltz, Performance and Media, 69–70. Parker-Starbuck’s use of Kristeva’s concept of the abject is rather “metaphoric”. The critic starts from a more abstract notion of Kristeva’s concept of “abjection” as “arising from within as a way to maintain life’s boundaries,” in order to “unhinge [abjection] from its specifically Kristevan or psychoanalytic roots, and transfer it to moments of instability, of crises of identity, of border crossings, of cultural anxiety, but always through corporeal affect.” Jennifer Parker-Starbuck, Cyborg Theatre : Corporeal/Technological Intersections in Multimedia Performance, Performance Interventions (Basingstoke: Palgrave Macmillan, 2011), 57, 54, 58. Lehmann, Postdramatic Theatre, 147; original emphasis. Dorsen, “Hello Hi There Text Render, Noorderzon Festival, Groningen, the Netherlands,” n.pag. Simon Shepherd and Mick Wallis, Drama, Theatre, Performance, New Critical Idiom (London: Routledge, 2004), 172, 174; Lehmann, Postdramatic, 83. “Hello Hi There Program” (Kaaitheater, 02/2016), n.pag. Dorsen and Soloski, “”Would You Like to Have a Question?,” 88. Hello, Admin I appreciate you to write this awesome article on kaldor and dorsens desktop performances I share this article with my friends … I loved this article thanks for sharing information.